Who is Asaram Bapu ? Asaram Bapu is 74 year old spiritual Guru for millions in India and worldwide. He has been in news off and on since year 2008 mostly. In 2008, a case was filed against him in alleged involvement in drowning of 2 children of his Gurukul. This was loudly relayed all across India by all media houses. A series of defamation and hate campaign against him was carried out then. Due to enormous interest shown by media in reporting this incident 24*7, the case escalated to CID. 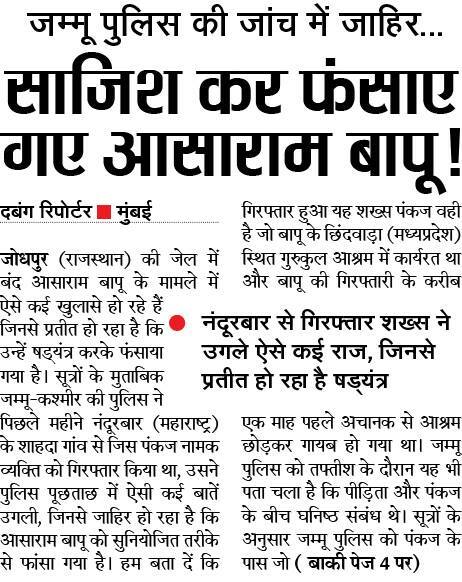 Both D K Trivedi Commission and CID, India have given clean chit in this case to Asaram Bapu and his organization. On 20 August 2013, a FIR was filed in Kamala Market, Delhi at 2:30 AM in night against him. Bholanand, one self-attested former resident of J&K Ashram of Asaram Bapu raised hue and cry when he gave an incriminating statement in one of LIVE News channel. He alleged (now found to be fake) that there were skeletons of children buried inside Asaram Bapu Ashram's premises in Bhagwati Nagar, Jammu. Media articulated this rumor with full gusto, without sparing a thought on authenticity and integrity of source/nature of this allegation. Vigilante citizens, not withstanding this fake assault of cooked up charges against the Ashram, registered a police complaint. On 17 October 2013, police had booked Nath, a resident of Jaipur in Rajasthan, for conspiring to implicate Asaram by claiming that three children were buried in his ashram at Bhagwati Nagar here after being murdered. 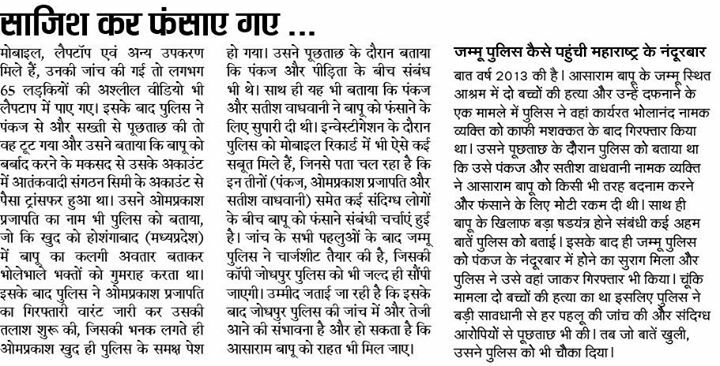 He was arrested on 14th Nov, 2013 for hatching conspiracy against Asaram Bapu. What do these revelations emphasize ? · Setting up of fake online accounts for outsourcing rumor factory against Ashram. Do wait for my next blog on detailed analysis carried out on Bholanand's confession and alleged role of omprakash prajapati. I'll keep searching for more interesting patterns in this "Kaleidoscope of Lies"
To the point , crisp & clean . Thank you for your comment. Keep watching this space for more posts. Also, please give any suggestions you could have formed on present write-ups, and what could be included for content of future blogs. Since 2010 , there have been several attempts to malign the name of Sant Asharam bapuji and his ashrams.This revelations makes very much sense but involvement of SIMI brings much surprise to me. Good Article with clean facts ! Thanks for your comments. As you rightly said present case against Asaram Bapu is a culmination of series of connected (?) small time attempts to defame him/his organization. Every conceit ( false news, tailoring of facts and bringing forward paid agents) has been put to use against him. We are hopeful that very soon, citizens all over India would come to know the truth behind it all.